When I saw the colors this week at Colour Me Beautiful I almost didn't even attempt a card. 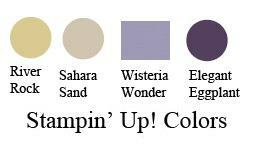 Wisteria Wonder is one of those colors that just doesn't appeal to me. However, as you'll see from my card, I buried the Wisteria Wonder so it only makes a tiny appearance. 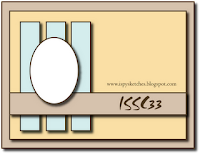 I decided the colors would make for a good brayered card, so with no idea of the final layout, I brayered a panel using Wisteria Wonder and Elegant Eggplant with some River Rock at the bottom. I then stamped two images from My Friend using black ink. It was at this point I realised I could use this card for the card sketch at iSpy Sketches, so I made a flower using Elegant Eggplant and Wisteria Wonder for the circular layer on the sketch. Unfortunately the last step involved spraying some Shimmer Mist onto the flower and I got a big blob of it in a very prominent place - I'm sure you can see it without looking too hard LOL. 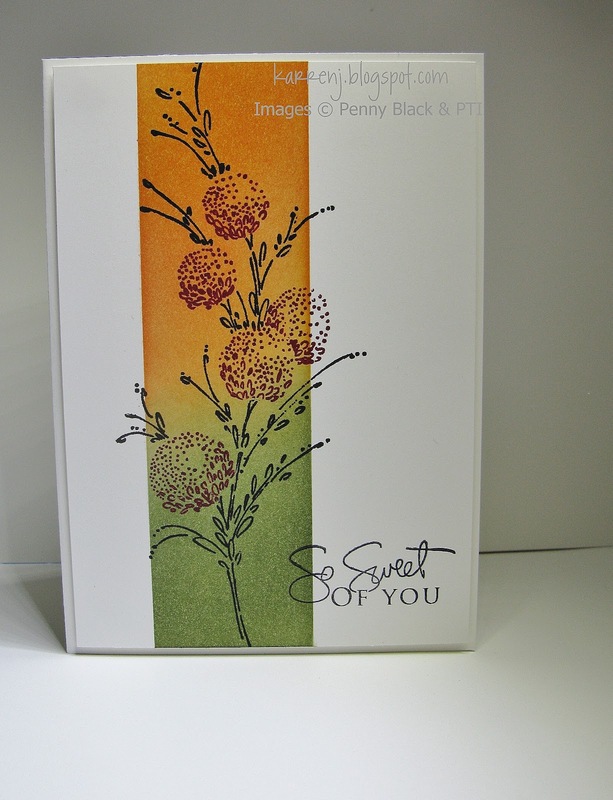 Edited to Add: The team at Colour Me Beautiful chose this card as their Colour Conqueror. Thanks guys! 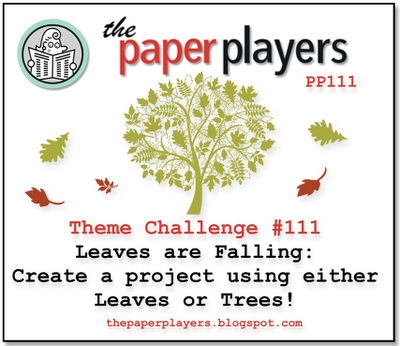 I haven't had a chance to play along with the challenges at Create with Connie & Mary for a few weeks now, so today when I had a chance, I grabbed it. 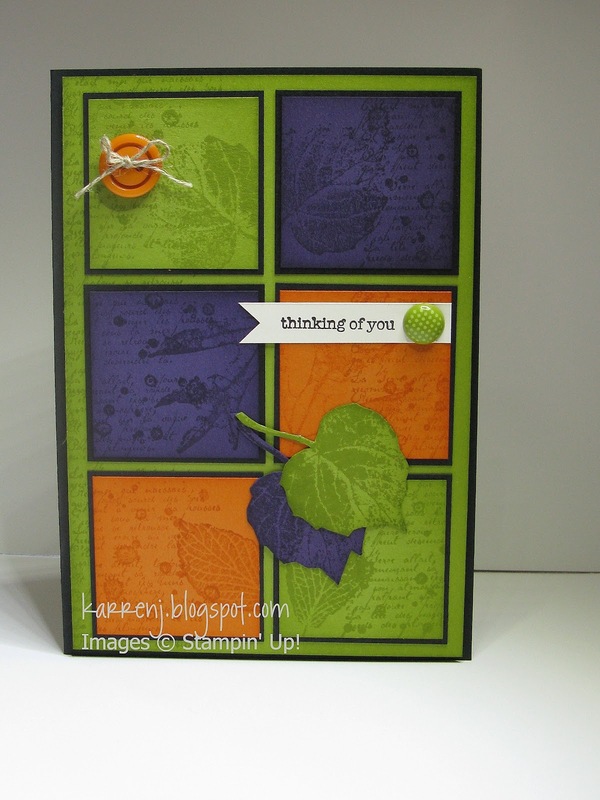 I wasn't sure how I was going to make these colors work together, but then I saw a card on Mary Fish's blog and the idea popped into my head, so most of the inspiration for this card comes from Mary. I white embossed the flower from Flower Fest onto Pink Pirouette and Baja Breeze cardstock, then cut out each flower. The small white panel and the flowers are popped up on dimensionals. The sentiment and bakers twine are Cherry Cobbler. 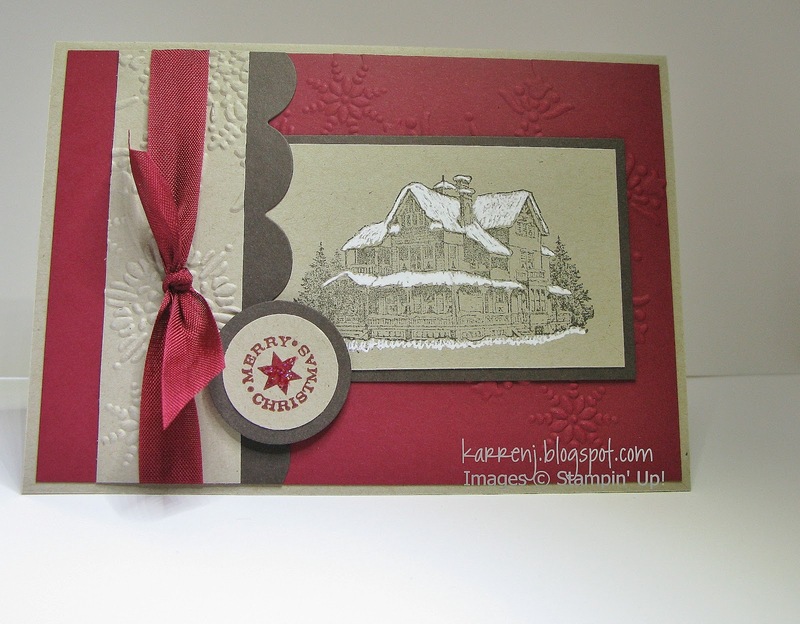 This card uses a leftover piece of faux patina cardstock that I created for this card here. I'd had it sitting on my desk all these months and thought it would work for the Just Add Ink sketch challenge this week. I cut strips of the faux patina cardstock and layered them on Basic Black, then onto a Soft Suede card base. The main image comes from Word Play which I colored using markers. 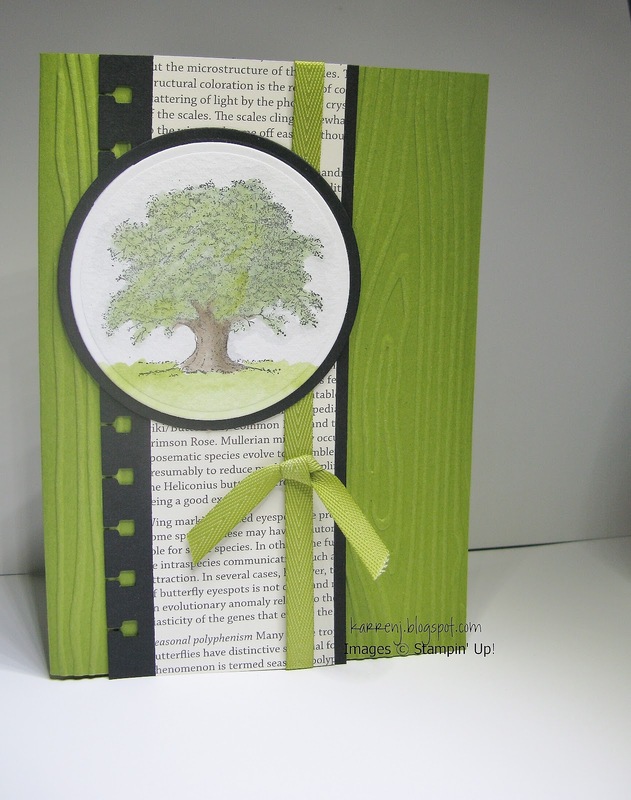 I then cut out using my oval nesties and put through the Designer Frames EF and layered onto a black oval. 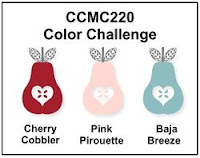 The finishing touch is a little Cherry Cobbler flower to match the Cherry Cobbler heart on the sentiment. Well, I've had a fun week. I finally convinced DH to let me move my stamp room from the 4th bedroom to the formal lounge, which had over the years become a storage room for the boys' stuff as well as their games room. My reasoning was that we never use the room because (a) we never entertain on a large scale and (b) it's such a mess we keep the doors shut all the time so it's a waste of real estate. At least if it was my stamp room, I'd keep it tidy(ish) LOL. My argument worked! Either that or Pete just got sick of my nagging... Anyway, Monday and Tuesday evenings were spent swapping the furniture between rooms. I took some before and after photos of my stamp rooms so if you're like me and love looking at other people's stamp areas, check back later because I'll post some photos. I have to keep some furniture in my stamp room because there is just not enough room in the 4th bedroom, but I can live with that. I've still got way more space to spread out my crap supplies. 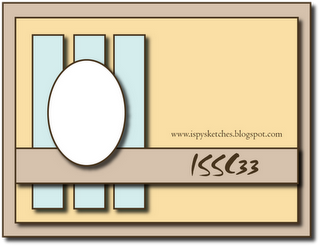 Here's the first card I made in my new room and my submission for this week's sketch at Freshly Made Sketches. When I first saw this sketch the other day, I had an idea percolating in my head, but today when I got to sit down and stamp, I went in a completely different direction. I love this sketch so I still might try my other idea when time permits. I took a few liberties with the sketch as you can see, but I quite like the end result. I white embossed the image onto the O Christmas Tree DSP from Deck the Halls, then adhered that panel to a Basic Black layer. I tied the gorgeous (sadly retired) 1 1/4" striped grosgrain ribbon around and tied a huge bow. This card is definitely going to have to be hand-delivered! Edited to Add: This card was chosen as Queen of Clean at Freshly Made Sketches this week. Thanks, Jen! This card came about via a very long-winded process. 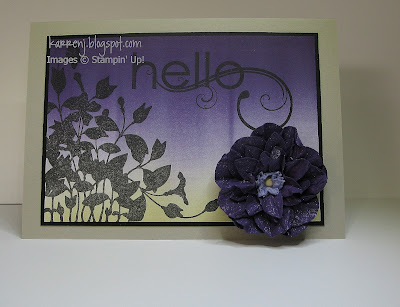 I wanted to try the technique challenge at Hand Stamped Sentiments which is crayon rubbed embossing. But, I didn't have any white crayons, so pulled out a gray crayon and proceeded with that. After rubbing the crayon onto the Very Vanilla cardstock, I thought the gray crayon might work with the color challenge at Fab Friday - So Saffron; Sahara Sand and Basic Gray. 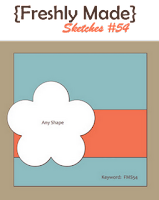 Then I thought I'd kill three birds with one stone and use the embossed panels in this week's Freshly Made Sketch challenge. So a three-fer! That doesn't happen often and it's a bonus when it does LOL. I had the idea to use a sentiment in the center circle so went looking through my sets. This set, Thanks for Caring, was perfect for the muted colors. Apart from the bow, this card came together reasonably quickly. I am definitely bow-challenged. This one looks okay if you close one eye and squint through the other LMAO. I moistened the tails to make them crinkly. 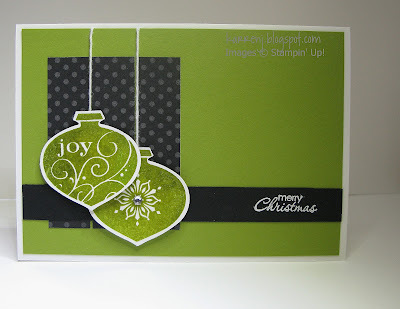 The crayon rubbed embossing is fun and easy, so if you haven't tried it yet, I urge you to have a go. 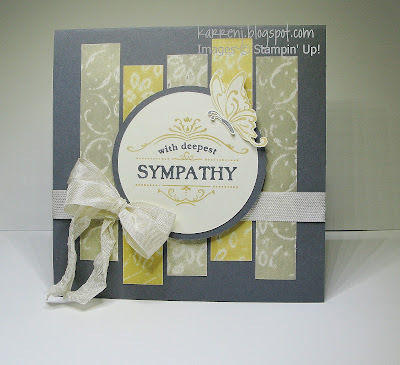 Accessories: So Saffron; Basic Gray markers; Circle Scissor; Finial Press EF; crayon; brayer; Very Vanilla Seam Binding. 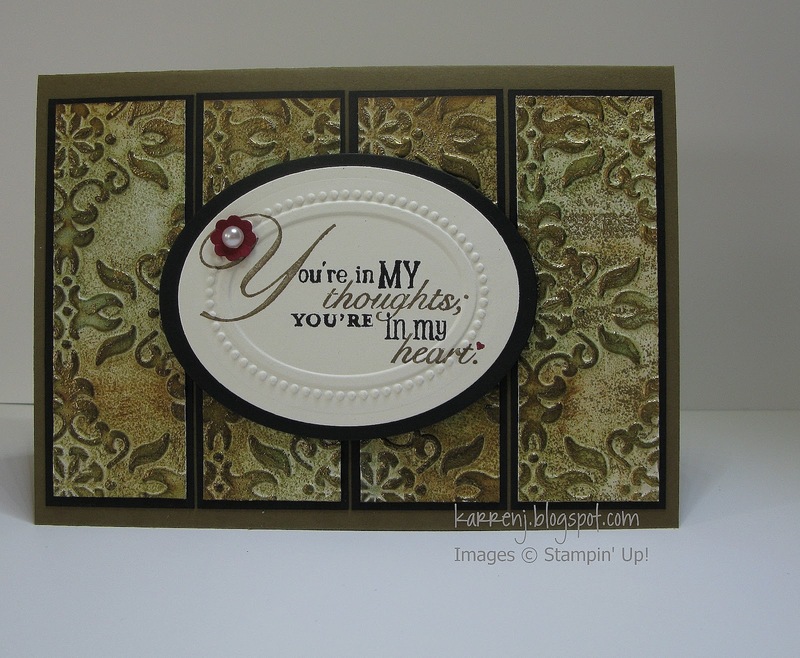 Edited to add: This card was an Artist Pick over at Hand Stamped Sentiments. Thanks, guys! For my second Christmas card for my upcoming class, I used this week's color combo at Dynamic Duos and the sketch at iSpy Sketches. I'm late to the party because I'm only just starting to love Lucky Limeade as a color. It really pops when used with Basic Black. I know it doesn't look like it, but the black polka dot DSP is actually three strips - the bakers twine covers up the gaps. The decorations are clear embossed making them nice and shiny IRL. There is a rhinestone in the center of the bottom decoration. I've been playing along at FMS most weeks since sketch #20, so decided to choose an earlier sketch. Sketch #6 flipped on its side worked for the lodge image from Christmas Lodge, so Sketch #6 it is. I stamped the lodge in Early Espresso on Crumb Cake, then colored the snow-covered parts with my white gel pen (saw this technique at a friend's house on Friday...thanks, Vicki LOL). 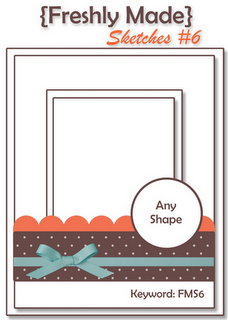 I used the Northern Flurry EF on both the Cherry Cobbler background and the Crumb Cake strip. 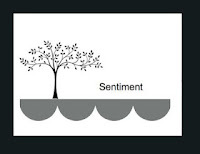 The sentiment comes from Delightful Decorations. I used a tiny bit of Dazzling Details on the star. Here's a quick card I made on Sunday night. 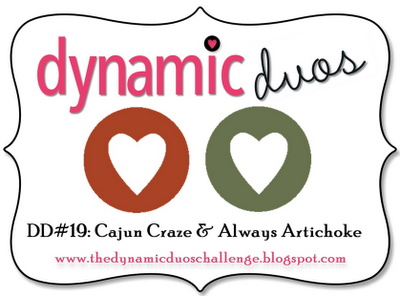 It's for this week's Dynamic Duos challenge colors of Cajun Craze and Always Artichoke and the gorgeous Sketch Frenzy Friday sketch. I made the flower using the Blossom Punch and the 5-petal Flower Punch. 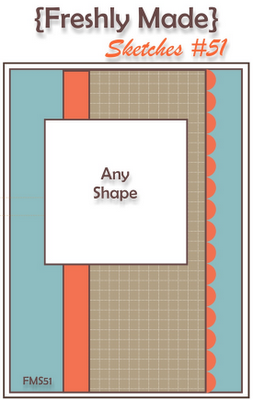 After I punched the shapes I separated the layers to create the Faux Suede look. 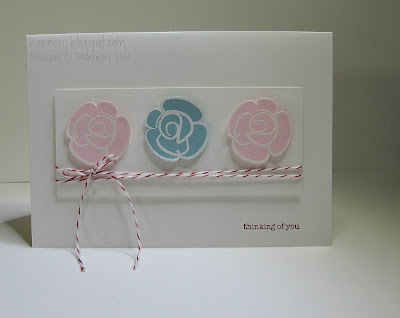 Lots of spritzing and scrunching to end up with the flower you see on the card. I put my scungy, well-used cutting plate on the wrong side of the Little Leaves Sizzlet and ended up with cut mark impressions on the side of the leaf I wanted showing, so I decided to put it through the Square Lattice Embossing Folder to hide those ugly marks! I quite like the added texture. Edited to Add: This card was awarded an Honorable Mention at Dynamic Duos. Thanks, guys! I'm a 99% Stampin' Up! girl, but occasionally I am lured by the beautiful images from other companies. This image is one of those that caught my eye. This card is my submission for the 2nd challenge at Colour Me Beautiful. I thought I could say that I'd used all the colors, but then I realised that I'd used Whisper White instead of Very Vanilla. Doh! Oh well, 4 out of 5 ain't bad. I masked off a piece of Whisper White then sponged Calypso Coral and More Mustard at the top and Always Artichoke at the bottom. 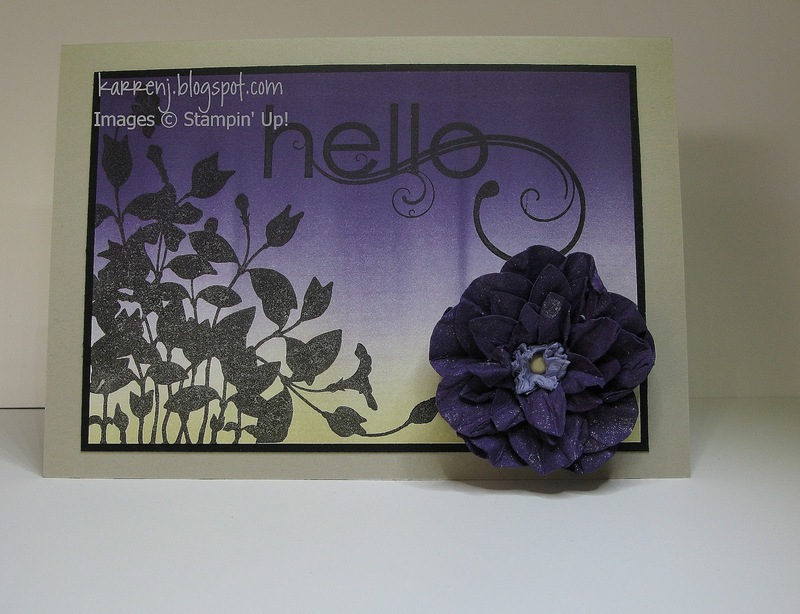 I then colored the stamp using Basic Black and Raspberry Ripple markers. I finished off with a sentiment from PTI. 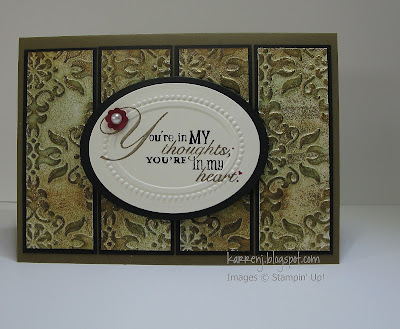 I considered all sorts of embellishments, but in the end decided to keep it CAS and simply layered it onto a Whisper White card base using dimensionals. 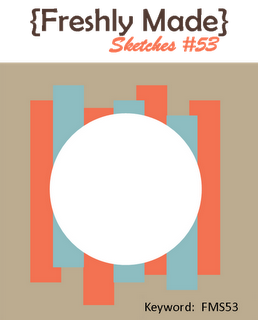 When I saw the colors at Pals Paper Arts this week, I thought uh oh! I don't do Halloween and they screamed Halloween to me. So I took a few liberties with nature and used the colors for an Autumn card. 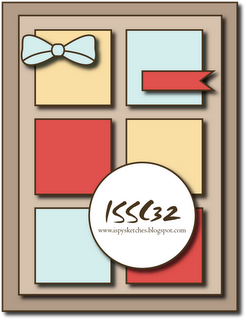 I thought the colors would look good on a color block card and the iSpy sketch was just perfect! There's a lot of sponging on this card to try and add some depth of color. 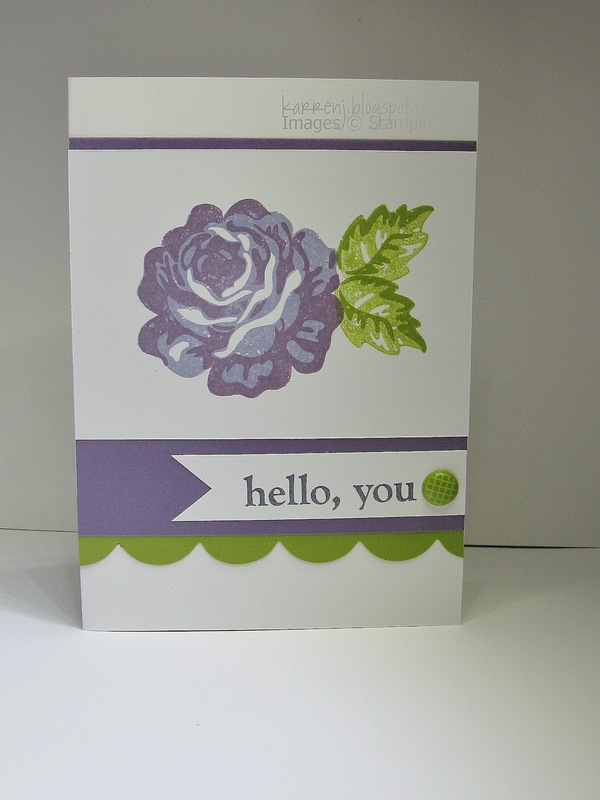 The French Foliage set is perfect for layering of stamped images and I used all but one of the images in the set. 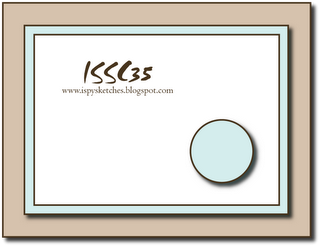 I had plans for the postmark image but it didn't pan out, otherwise that would have been used as well. I'm showing my age here, but the title of my post has me singing... Tie a yellow ribbon round the old oak tree... and now I can't get it out of my head! 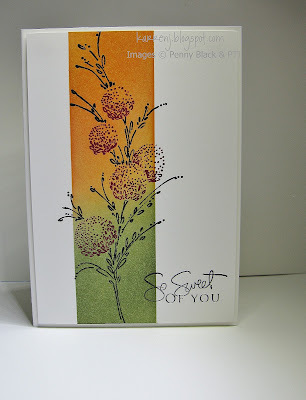 This card is for this week's sketch at Freshly Made Sketches and the challenge at Paper Players. 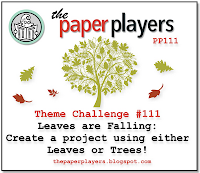 I haven't looked at the entries for the Paper Players challenge but I'd hazard a guess that I'm not the only one to use Lovely as a Tree for this challenge LOL. I stamped the oak tree onto watercolor paper and colored with markers and blender pen. 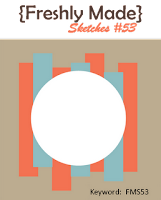 I cut out the image using my circle nesties. The card base was embossed using the Woodgrain EF, then I used the retired Spiral punch to add a little somethin' somethin' down the left side. The twill is long retired Old Olive Polytwill ribbon. Edited to Add: This card was chosen as a Cut Above card this week at Paper Players and also for a Perfect Princess Award at Freshly Made Sketches. Yay! 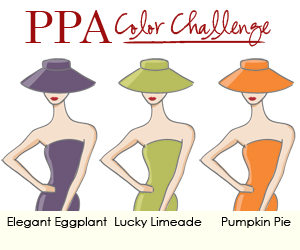 Two cool new challenges hit the scene this week - Fab Friday and Colour Me Beautiful. Unfortunately, I missed the deadline for Colour Me Beautiful but as I got the color inspiration from there, I'm linking their site anyway. 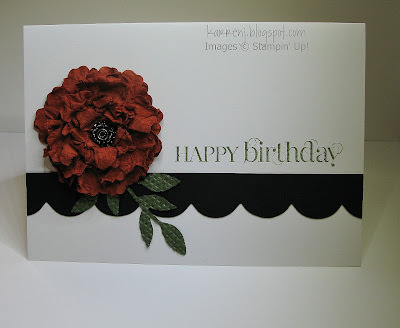 For my card, I went for a lot of white space on my card and pulled out an old Stampin' Up! set called A Rose is a Rose. I used Wisteria Wonder and Perfect Plum for the rose and Lucky Limeade stamped full strength, then stamped off for the leaves. 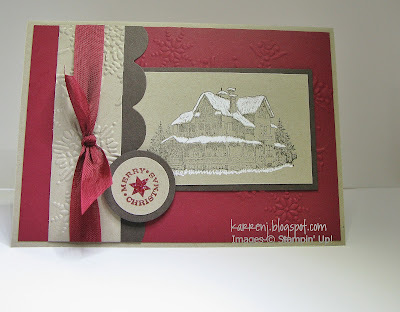 I stamped the sentiment using Basic Gray, so managed to get in 4 of the 5 colors from the challenge. 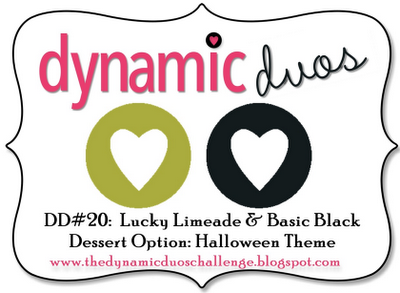 I'm really liking Perfect Plum and Lucky Limeade together - two colors I probably wouldn't have considered pairing up.